Heat pumps give year round savings. In summer they remove heat from inside the home (75°) and expel it outside (95°), effectively cooling and dehumidifying for perfect indoor comfort. In the winter months the action is reversed, heat is absorbed from outside, even though it maybe 40° outside, compressed or concentrated then sent into the home to efficiently provide comfort (72°). The warmer it is outside the more heat is available for the heat pump to move inside, however when outdoor temps fall below 35°-45° the heat pump has to work more to provide heat in the home. 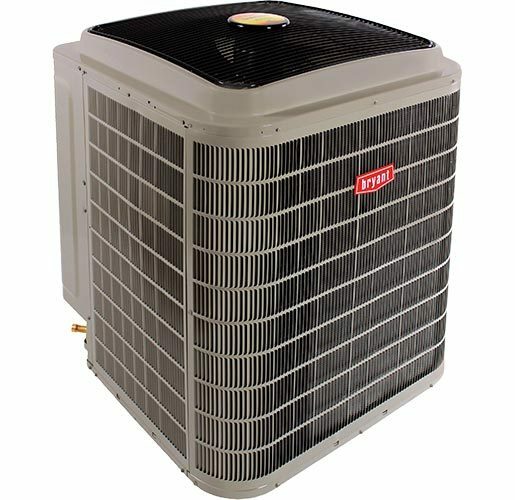 The normally very efficient heat pump unit begins to become less and less efficient the colder the outdoor temps become. Thus with outdoor temperatures ranging from 60° to 40° the heat pump is an extremely energy efficient unit. Heat pumps can be more than twice as efficient as gas or electric heat. However, as outdoor temps drop through the 30’s and into the 20’s a heat pump unit will run continuously and much less energy efficiently, it needs some help. HYBRID HEAT® dual fuel systems combines the strengths of two heating sources. HYBRID HEAT® includes the incredible efficiency of a heat pump at mild winter temps and the necessary BTU output of a gas furnace when temps drop. This system gives you more control over your monthly heating bills by allowing you to select the most economical heating source in your area. Once the system is set, all you have to do is relax and enjoy the savings. Your HYBRID HEAT® Dual Fuel System will automatically switch between the two fuel sources to not only maintain your comfort, but to deliver on the promise of money-saving operation. What Does the SEER Rating Mean? An air conditioning systems energy efficiency is classified by the S.E.E.R. rating. The SEER, which stands for (seasonal energy efficiency ratio), rating of the energy efficiency an air conditioning unit during a full season of operation. Using an air conditioning system with a higher SEER rating means the AC system uses energy more efficiently than an air conditioning unit with a lower SEER rating. Higher Seer rating saves you money on your home cooling utility bills. The SEER rating is seems to be based on the average of 83 degrees Fahrenheit. So for every 5 degrees warmer than 83 degrees, deduct 1 from the SEER value. The rating HSPF is a heat pump's estimated seasonal heating output in BTUs divided by the amount of energy that it consumes in watt-hours. A heat pump with a high HSPF is more efficient than a heat pump with a low HSPF. BTU stands for The British thermal unit (BTU) It represents the amount of thermal energy necessary to raise the temperature of one pound of liquid water by one degree Fahrenheit. Factory Warranty Parts 10-year parts limited warranty when properly registered. Factory Warranty Compressor 10-year parts limited warranty when properly registered. Quality Equipment, Knowledgeable Design, Superior Workmanship & Service After The Sale Makes Our Comfort System Extraordinary!